Martha Stewart Living Omnimedia- the media empire of ruler of all things domestic, Martha Stewart- is the latest print mag to hook readers in digital formats with an attractively priced subscription option for iPad users. Two of the publishers’ titles- Martha Stewart Living and Everyday Food- will be available on a subscription basis for iPad starting in September, ranging in price from $12 to $20 per year. And according to paidContent, the publisher also hopes to see a digital revenue boost from a web-based advertorial partnership with appliance-maker Frigidaire. 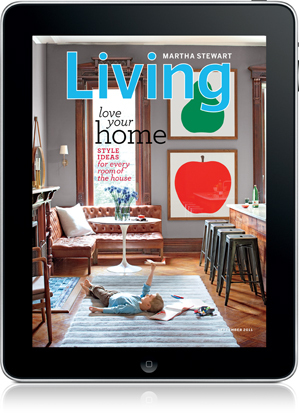 From September 2011 editions on, digital readers will be able to subscribe to the publications via In-App Purchase through the App Store or at marthastewart.com and print subscribers will be allowed iPad access through the duration of their subscription. New subscribers will also be granted digital access, though it isn’t clear if the policy will stand long-term. Individual issues will be available through the site and for In-App Purchase at $2.99 for Everyday Food and $3.99 for Martha Stewart Living.